The Masterpiece print of Jesus' Face is the most breathtaking print I have ever seen. Bette Myers, world renown portrait artist, earned the regard and respect of her peers for half a century. Her satisfied clientele includes celebrities such as Senator Barry Goldwater; Senator & Mrs. Len & Grace Jordon; former First Lady Jacqueline Kennedy; Jack Morgan (leader of the Russ Morgan Orchestra and others. Many private collections continued to grow thru her death approximately 10 years ago. Of special interest of all of Bette Myers portraits is a portrait from her Private Collection called The Masterpiece. A brush with death in 1974 left Bette with a peaceful taste of the hereafter and an unforgettable image of Jesus Christ. Ten years later, while starting an undefined portrait before a local dignitary, Bette was miraculously inspired through a deep trance - like never before - or ever again. In pastel, our artist formed The Masterpiece in an unimaginable 135 minutes. When her son Chuck, her most meticulous critic, saw the painting, he exclaimed "Mom, that is a masterpiece". At that moment Bette knew that she had fullfilled her commission from Jesus. And now the product of her blessed experiece that created this unique portrait, confirmed by others as authentic, is available for all to see and believe. 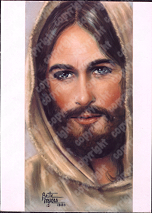 Order a print today and experience the blessing of looking into the eyes of Jesus! We accept PayPal orders and we'll do our best to make sure you have your copyrighted print as quickly as possible. Because your print will be processed from the original negative ( Not a "copy of a copy" ) please allow 6-8 weeks for shipment. When ordering please note there is a 15% restocking charge on any returns. Need additional information? Contact us by email and we'll try to get right back to you!